With a 7-inch touch screen control, great gas mileage, and a sleek exterior, what’s not to love about the 2013 Buick Encore? Buick lovers have been looking for a compact crossover in the carmaker’s lineup, and they’ve finally found it with the 2013 Buick Encore. While it might be the smallest vehicle in its segment, the Encore still brings big styling with a prominent front grille highlighting its elegantly rounded front-end and a sloping roof providing the illusion of sportiness that you can’t help but love. 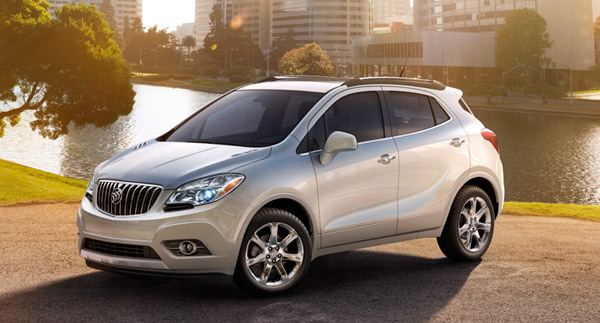 Each 2013 Buick Encore is powered by a turbocharged 1.4-liter inline four-cylinder with 138 horsepower and 148 lb-ft of torque. The only transmission available is a six-speed automatic with a manual-shift feature, though buyers do have an option between front-wheel-drive or all-wheel-drive. EPA-estimated fuel economy for front-wheel-drive models come in at 28 mpg combined, while the all-wheel-drive models have a slightly lower mpg with 26 combined. Soft-touch materials and hints of wood and metallic accents come together to create an interior that exudes subtle luxury. A 7-inch control touchscreen keeps both the driver and passengers connected through Buick’s standard IntelliLink system, while the wide seats provide comfort for both front- and backseat passengers. Legroom is plentiful, even for those who seem like the distant relatives of giants, and cargo-carrying is made easy with fold-flat rear and front passenger seats. Antilock disc brakes, stability and traction control, along with a number of airbags are all standard safety features for the 2013 Buick Encore. Also standard is OnStar, GM’s emergency telematics system that includes automatic crash notification, on-demand roadside assistance, remote door unlocking, and stolen vehicle assistance. Optional safety features are forward collision warning and lane departure warning.